The decision of the Historic Sites and Monuments Board of Canada to mark the Observatory at the University of New Brunswick with a plqaue has been recorded in an earlier issue of the Journal (vol. 48, p.220, 1954). 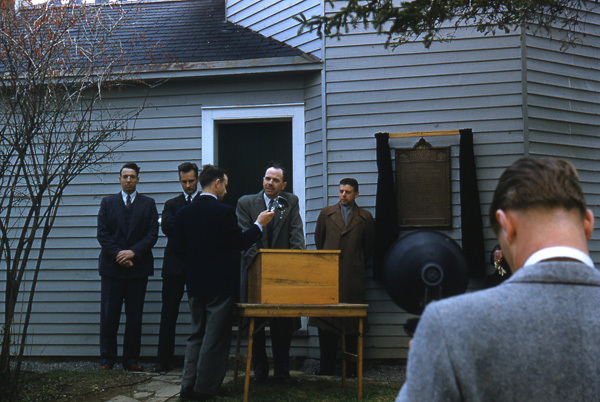 The unveiling ceremony was held on May 10th, 1955, at 11 a.m., as one of the Encaenia Week Functions at the provincial University. The weather - cloudy and cool with a fairly strong wind - could not be described as favourable for an outdoor event, but the large attendance gave evidence of a renewal of local interest in astronomy and in this historic Observatory. The unveiling ceremony was conducted by University President Colin B. Mackay with Dr. C. McN. Steeves, Dr. A.G. Bailey, Dr. J.F. Heard and Professor J.E. Kennedy participating in the function. In welcoming the many visitors to the University, Dr. Mackay made particular reference to the presence of the premier of New Brunswick and Mrs. Flemming, His Worship the Mayor of Fredericton and Mrs. Wright, and members of the local chapters of the I.O.D.E. He also extended a sincere welcome to other distinguished guests, among whom was Mrs. F.T. Dunlop of Saint John, a grand-daughter of William Brydone Jack. 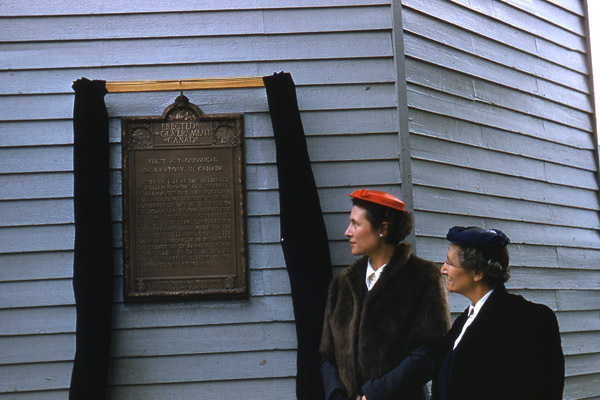 "In 1947 the Government of Canada recognized the University of New Brunswick as the birthplace of Canadian literature when I placed on this campus the monument in memory of Sir charles G.D. Roberts, Bliss Carman and Francis Sherman. A year ago we unveiled a tablet in memory of Canada's first native born novelist, Julia Catherine Beckwith Hart. "This campus has been recognized no only for those distinguished men and women who have lived and worked here, but also for its old and historic buildings which have played such a significant part in the growth of higher education in Canada. "A few years ago the Historic Sites and Monuments Board marked the Arts building as the oldest existing university building in Canada. To-day, on the recommendation of that same Board, the Dominion Government is officially recognizing the University's Observatory as the First Astronomical Observatory in Canada. 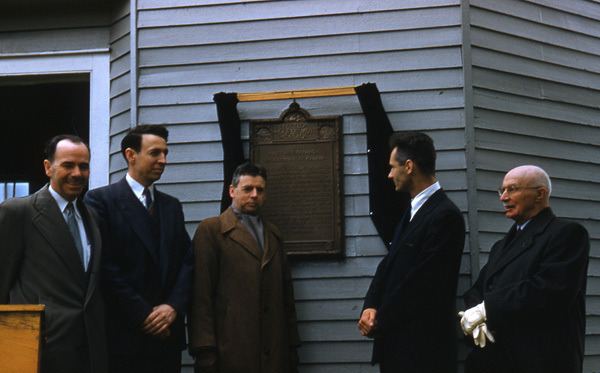 To unveil the plaque and read the inscription, the President called upon Dr. C. McN. Steeves, a senior member of the University Senate, who has been untiring in his efforts to preserve and restore the Observatory. Dr. Steeves was one of the members of the class of 1905 who had returned to the University to celebrate their fiftieth anniversary during Encaenia Week. Built in 1851 at the instigation of William Brydone Jack, professor of mathematics, natural philosophy and astronomy; President of the University of New Brunswick, 1861-85. Schooled in the traditions of the Scottish universities, he equipped the observatory with the best instruments of the day. In collaboration with Harvard observatory he determined the longitude of Fredericton and other places in New Brunswick and corrected errors in the international boundary. Dr. Bailey, Dean of the Faculty of Arts, and New Brunswick representative on the Historic Sites and Monuments Board was requested by the President to make the formal presentation of the plaque to the University, on behalf of the Government of Canada. Before performing this official duty, Dr. Bailey read a telegram received from the Honourable Milton F. Gregg, Minister of Labour in the Federal Cabinet, expressing his regret that pressure of work at Ottawa make it impossible for him to attend the ceremony. "In 1851, William Brydone Jack completed this Observatory and applied for the chair of Mathematics at the University of Toronto. Dr. Jack was not selected for this appointment, but spent the remainder of his academic life in the service of this University. It seemed appropriate that the University of Toronto, having made this ceremony possible by their actions of over a century ago, should also make it successful by sending the Head of their Department of Astronomy to address us to-day. "Dr. J.F. Heard has been associated with the Department of Astronomy at Toronto for the past twenty years, except for his period of service in the Royal Canadian Air Force during the second world war. In 1952, he was appointed Head of the Department and Director of the David Dunlap Observatory. Last year, he acted on behalf of all Canadian amateur astronomers as President of the Royal Astronomical Society of Canada. "We are very pleased to welcome Dr. Heard on his first visit to Fredericton and to the campus of the University of New Brunswick." Dr. Heard then delivered the address which follows, linking together the "all-but-forgotten" past, calling attention to the present, and expressing a hope for the future. "On the occasion of the unveiling of this plaque marking the oldest Astronomical Observatory in Canada, it is my privilege to bring to the University of New Brunswick the congratulations of the University of Toronto and of the Royal Astronomical Society of Canada. 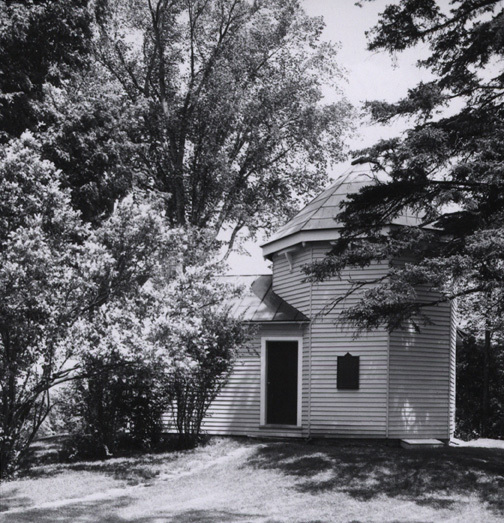 "In his interesting enquiry into the history of this Observatory, Professor Kennedy has shown that without doubt it is the First Astronomical Observatory in Canada. Indeed it was a good many years after 1851 before the Government of Canada recognized the need for a government astronomical observatory and took steps to found the Dominion Observatory at Ottawa. "To me it is a very interesting fact that many of the observatories which were founded in the 17th, 18th and 19th centuries have shared a common raison d'être, namely the search for longitude. This was a problem which had plagued astronomers and geographers from the time of Copernicus and christopher columbus. Latitude could be measured with relative ease even in the days of Columbus, but the longitude remained elusive, especially at sea and beyond the continent of Europe. Because he had no way of measuring longitude, columbus believed that he had reached the Orient. The Jesuit Fathers of our country repeatedly sought, all during the 17th century, to establish the longitude or the distance from paris of their missions and settlements. To this end they eagerly observed every eclipse which was predicted by the astronomers in France. "The situation had become so acute by the middle of the 17th century that the British Government offered a prize of £20,000 for a practicable means of determining longitude at sea and overseas. Out of this competition grew the need for an astronomical observatory to test the proposals put forward, and in 1675 the Royal Greenwich Observatory was founded. Eventually practicable methods were developed, thanks largely to the invention of the chronometer by the Yorkshire carpenter, John harrison. The use of the chronometer for longitudes put new tasks upon astronomers, namely the need for increasing precision of time determination by the stars, the adjustment of field instruments and the training of surveyors in astronomical observations. "There is no doubt, as Professor Kennedy has shown, that your renowned Dr. William Brydone Jack founded this Observatory with these very things in mind. It is tempting to believe, moreover, that the aggressive astronomical work which Brydone Jack pursued here played a part in the development of astronomical surveying which, later in the 19th century, when the West was added to Canada, became a necessary responsibility of the Government of Canada and led, in turn, directly to the founding of the Dominion Observatory. "Then, apparently by some accident, the interest in astronomy here lapsed - as it has elsewhere from time to time - and this Observatory and the work of that pioneer Canadian astromoner were all but forgotten. But the stars have endured for about five billion years, and here again, after a mere seventy, risen like the Phoenix, is a splendidly refurbished little Observatory ready once more to inspire students with the wonder and the spirit of enquiry which have always characterized man's approach to the heaven's. "In offering my congratulations to you, I would like to express the hope that those of you who have been responsible for this renewal of astronomical interest will find the encouragement which your efforts merit. To be more specific, I hope that courses in astronomy will be added to the University curriculum. I hope, also, that a Fredericton Centre of the Royal Astronomical Society of Canada will come into being, and flourish under the aegis of the University teaching staff. 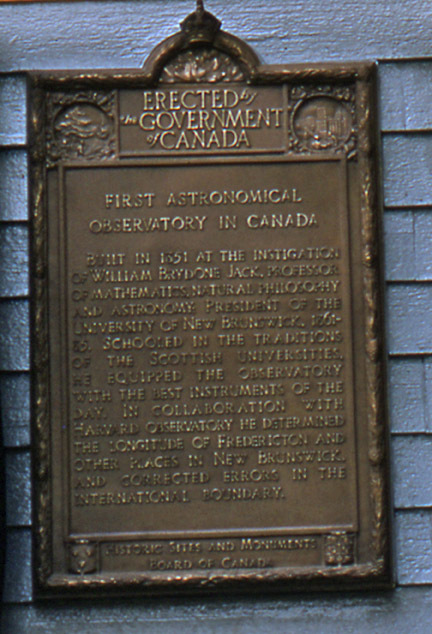 May the City of Fredericton and the University of New Brunswick once more, as in the days of William Brydone Jack, play important roles in Canadian Astronomy." Dr. Mackay expressed his thanks to Dr. Heard and noted the efforts of Professors Stevens and Kennedy of the University Faculty in supervising the restoration of the Observatory and in rebuilding the telescope. In closing, the President invited all attending the ceremony to avail themselves of a conducted tour through the Observatory where some of the historic instruments used in making early astronomical observations were on display. As an added feature, there was a splendid exhibit of old documents and books relating to the pioneer work of William Brydone Jack, which proved interesting to the many visitors. This exhibit had been arranged for the occasion by Mr. Robert Rogers, Archivist at the University of New Brunswick Library. While the unveiling of the plaque brings to completion one phase in the restoration of this historic Observatory, let us hope that the second phase may see the fruition of the challenge presented to us by Dr. Heard.